A note from Fleet Feet Amy: Running and walking is a journey, and everyone’s is different. I love hearing about people’s journeys: Where they started and where they are aiming to go! Sometimes, that person is a member of my family! Meet my cousin Amy. Her journey has continued to inspire me & others as she shares her adventures on social media. I’m so proud of her and she has given me a new appreciation for the gift that is running. I asked her to share her story, so here it is! Keep moving forward Amy! A short introduction for you: My name is Amy. I live in Appleton with my husband Grant and our 3 kids Aryssa (7), Carson (5) and Maycee (3). I played tennis in high school and was semi-active throughout my early adulthood. 2008, I married my high school sweetheart and shortly after that became pregnant with our ﬁrst child (2009), then 25 months later our second (2011), and 21 months after that our third (2013)! I was always a fan of walking and never even thought about running. I hold my weight in my legs and booty, and honestly the thought of running scared me! I had tried and failed some diets and even joined a gym for a short time…but always reverted back to lazy ways. In August 2015 I saw a picture of myself and was almost in tears with how far I had let myself go. I decided to try some work out videos at home. I had some great success in the ﬁrst 21 days I lost 5 lbs and 11.7 inches! With that I was also walking to and from my daughter’s school (1 mile in the morning, 1 mile in the afternoon) 3 days a week and 1 mile 2 days a week. I stayed pretty consistent working out with those 30 min DVDs 4-5 days a week. I felt strong! I ordered the extreme versions in December 2015 and continued on my way. The problem was I quickly would get bored & lost the excitement of the workouts. I didn’t feel like 30 minutes was really doing anything. So I started doing an extreme in the morning and a regular with my husband at night. I was feeling strong, but the weight plateaued and I was stuck in a rut. Then July 26, 2016, we got a call we never expected…. My husband’s father…. something happened…. get here. My father-in-law passed away from a sudden and massive heart attack at the young age of 61. We were in shock, but with that it really hit my husband, “that could be me in 30 years if I don’t make a change.” After the funeral life began to take on a new normal, my husband got up early and went for a mile walk before work. He made a conscious effort to get up more from his desk and quit drinking soda. That sparked me to again focus on my journey. With it being summer I walked with the kids to a park that is always quiet, and that was the ﬁrst day in probably 5-7 years I ran. I ran one lap around the park 4 times which probably totaled .4 of a mile. BUT I did it! That weekend as a family we went back to that park and my husband and I both ran that lap a couple times. I was elated, it was a feeling I had not felt in a long time, if ever before. That following Monday I was able to run 2 laps at a time around that park! And I didn’t totally hate it! We began hiking as a family on the weekends, hitting up state parks and local trails. In August with another Wisconsin winter in the future we decided to go treadmill shopping. On August 24, 2016, I attempted my ﬁrst treadmill run. I was able to run 2 laps ( .50 mile ) out of 2 miles. I couldn’t believe it and couldn’t wait to do it again!!! I then started to do one lap walking, one lap running and would average 3.25 miles total. Through this new found love of running. I have had not only the amazing support of my husband, but also my cousins Ashley and Amy. Ashley was helpful in answering my newbie questions and then pushing me to try more. She encouraged me to try running half a mile before walking, then 1 mile etc. ME, did she just ask ME a non runner to run 1 mile?!?!? I still didn’t consider myself a runner. I couldn’t run any consecutive distance. I was a walker who ran sometimes. 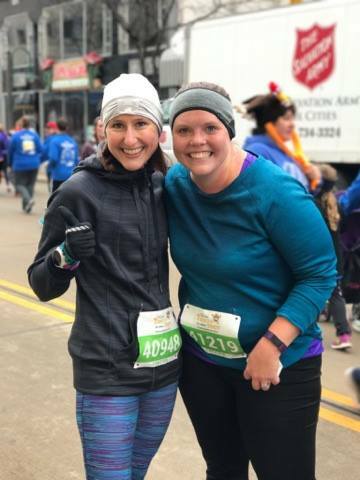 Ashley and Amy continuously encouraged and bashed into my head “you ARE a runner!” “You run, that means you are a runner.” I stopped second guessing myself and ﬁnally began feeling that “I AM a runner.” I started to run without stopping and slowly up my distance. Now this running journey has not been all rainbows and smiles. Running is hard and a test no matter your skill level or length of time you have been running. Amy invited me to join a local moms running group and decided to go on my ﬁrst ofﬁcial outdoor run with her and one of her friends. Let me tell you it was HARD, it was HORRIBLE, It was emotional. Running on the treadmill had been easy, smooth and “perfect:” How can outside be so hard?! I came home from that ﬁrst failed outdoor run, cried on my husband’s shoulder and then sucked it up and ran 2 miles on my treadmill- easily and steady. A church friend called me after seeing my Facebook post and just talked with me. I couldn’t let that one outdoor run break me. The next day I tried again. Again it was hard, but a little easier. That’s when my lovely cousin dropped a bomb on me—- “Let’s do the 5-mile turkey trot run on Thanksgiving Day!” WHAT you mean like OUTSIDE!?!? And where other people can see me?! BUT a month later we did it, I did it! Our ﬁnish wasn’t fast, but the whole way she encouraged me & pushed me when I needed pushing. Amy found us when we were on the ﬁnal stretch and snapped a quick picture of us and gave me a ton of encouraging words. I came home to handmade cards and pictures from my kids and husband, and a permanent smile that no-one could take away from me. I am now able to run 3-5 miles and am starting to work on speed. I can happily say I am now able to break a 10-min mile and today my 3 miles were at a 9:50 min pace. Running is not always easy as a woman: Some weeks are harder than others, as a mom we know kids attitudes change by the ticking seconds and that means treadmill times are sometimes cut short and severely interrupted. BUT, I keep pushing and praying that one day my outside running will be as successful as my inside running. I am excited for spring and the thought of great run, but I know I will still have bad days, hard days and frustrating days. I know I will be able to keep pushing and making good choices. I have the support of my family and friends, and especially, my husband. 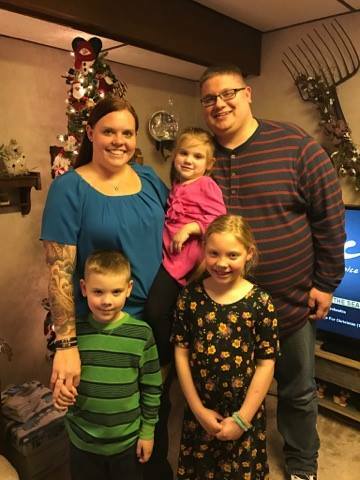 Since the beginning of our journey he has lost almost 50 lbs and I have lost 25 lbs (15 of that since July 2016), but beyond that I have gained conﬁdence, a new found escape for the hard days and a positive example to my kids. To all those people who don’t think they can be a runner- YOU CAN! One foot in front of the other is all it takes, but know it isn’t always easy. There will be happy tears and frustrating tears, smiles and screams, joy and pain, trials that will try to break you. My journey is my journey and yours will be yours. Find people that will lift you up when you are down and will praise you in your success. Join a running group and just run. I have overcome my fears, I have overcome my doubts, I have overcome myself. I AM a runner.